Holland America Line has announced two staffing changes after last week's news that Seabourn Cruise Line would be moving its headquarters from Miami to Seattle. As part of that move Richard (Rick) Meadows, Holland America's executive vice president-sales, marketing and guest relations, was named president of Seabourn, taking over from Pam Conover after a transition period. John Delaney has now been named senior vice president-marketing and sales for Seabourn. Delaney has been Holland America's vice president-revenue management for the past two years. 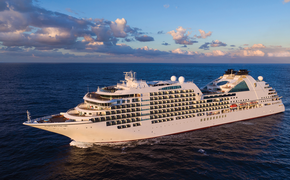 Jack Anderson had been serving as senior vice president-sales and marketing for Seabourn. Delaney previously spent the previous five years working on special projects for Carnival Corporation with about half his time spent on Holland America Line initiatives. His projects focused on financial and operational analytics in a wide array of areas including marketing, sales channel performance, procurement, and logistics. he also spent six years working in various capacities including revenue management, capital planning, and managing the planning and forecasting function for the theme park division of Walt Disney Company. Meanwhile, Mark Kammerer will rejoin Holland America as senior vice president-marketing and North American sales, reporting to Meadows. Kammerer is currently vice president-cruise sales and exclusive product for Virtuoso, the luxury travel agent marketing group. He previously served as general manager-cruise and distribution marketing at Expedia, vice president-global marketing at Holland America, and vice president-North America at Club Med. For more information, visit www.hollandamerica.com or www.seabourn.com.